John Robert Roach was born in Prior Lake, Minnesota in 1921. He was ordained a priest for the Archdiocese of Saint Paul in 1946 and consecrated auxiliary bishop for the diocese in 1971. After the death of coadjutor Archbishop Byrne, Archbishop Binz needed a new successor, as his health continued to decline. Bishop Roach was appointed the sixth Archbishop of Saint Paul and Minneapolis upon the retirement of Archbishop Binz on May 28, 1975. Being the only native son to lead the Archdiocese (although Archbishop Ireland had moved to Saint Paul as a youth) Archbishop Roach was well liked and highly respected by both clergy and lay people. He was known to be a capable administrator, both as headmaster of Saint Thomas Academy and the founding rector of Saint John Vianney College Seminary on the University of Saint Thomas campus. Moreover, he was chosen by his fellow bishops to be president of National Conference of Catholic Bishops from 1983 through 1985, and was elected president of National Catholic Rural Life Conference in 1986. Due to the growing demands of leadership, the Archdiocese was divided into three vicariates in 1985, with an auxiliary bishop responding to the pastoral needs of each area. Archbishop Roach ordained suffragan bishops and several auxiliary bishops, all of whom later became the ordinaries of other dioceses. Those consecrated bishop by him were Paul Dudley, John Kinney, Victor Balke, William Bullock, Robert Brom, Robert Carlson, Jerome Hanus OSB, Joseph Charron CPPS, and Roger Schwietz OMI. Archbishop Roach also instituted a permanent diaconate program and ordained the first permanent deacons for the Archdiocese. He oversaw the growth of a variety of Archdiocesan programs, including offices for evangelization, AIDS ministry, African-American Catholics, and the Archdiocesan Commission on the Role of Women in the Church. Moreover, he directed that the Archdiocese and its parishes reach out to a new wave of immigrant groups, including Hispanic, Hmong, and Vietnamese people. New homes were built for both Archdiocesan seminaries during his tenure. He created the Catholic Community Foundation and helped found the United States Papal Foundation. He published the nation’s first written policy on sexual abuse by priests, as well as the first Comprehensive Pastoral Statements on Sexual Issues in Ministry. The legalization of abortion in 1973 posed an ongoing challenge to Archbishop Roach’s belief in a consistent ethic of respect for the life and integrity of the human person. He strove to maintain fidelity to Church teaching in the midst of growing opposition, always affirming the Church’s support of the Right to Life. The Archbishop grew throughout his life as a compassionate pastoral leader who, echoing Pope Paul VI’s call for spiritual renewal within the Church, challenged the faithful of the Archdiocese to a deeper Gospel spirituality. 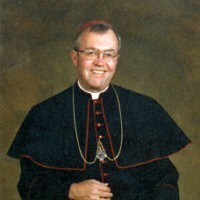 Archbishop Roach died on July 11, 2003, after retiring as Archbishop of the Archdiocese on September 8, 1995.